The Challenge project for this month commemorates the 200th anniversary of The Star-Spangled Banner, and includes a size requirement – at least 42″ on a side. 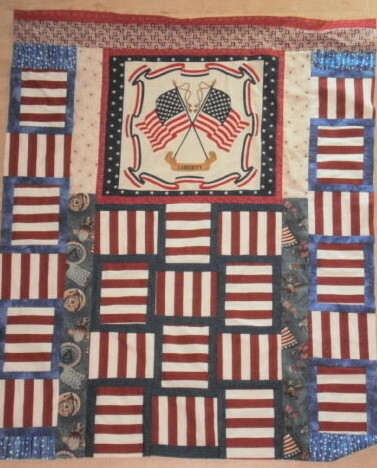 “Self,” I said, “if you make the project a little larger you can turn it into a Quilt of Valor donation. You have too large a stash to make only small quilts.” Turns out, there’s a reason I make small quilts. Large quilts are a pain in the patoot. And the shoulders, and the arms and hands. Slinging around long strips, cleaning off the ironing board to press the thing properly – yowza! I much prefer the elegantly tiny postcard quilt my friend Thea McCurry sent me. However, thanks to the excellent taste of the quilt store owners in my area, I have a lot of fabric to go through. So, do I make myself a dozen more tote bags, blanket the country with postcard quilts, or stop my whining and make a few more large quilts to give away? I may have mentioned bidding on every embroidery package at the last Amador Valley Quilters silent auction because I can never find embroidery supplies when I need them. My plan was to sprinkle the packets around the sewing room so no matter what corner was currently blocked with too much stuff, I could still find some floss and needles. 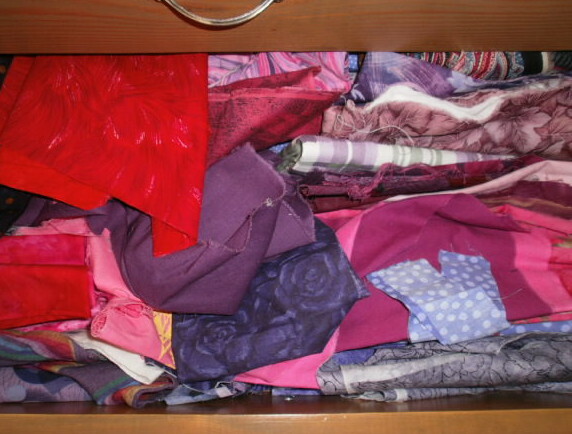 This week I was looking for something else – zippers, in fact, for a friend to use in a sewing class – and I cleared out an entire bin’s worth of random supplies. 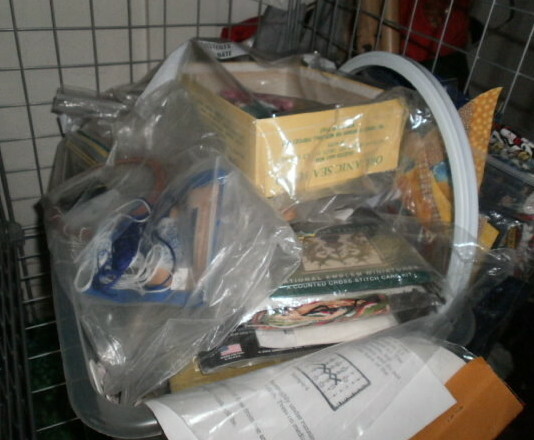 Then I put all my embroidery supplies in the extra bin. This is a double victory, if you don’t count not finding the zippers. First, I know where my embroidery supplies are. 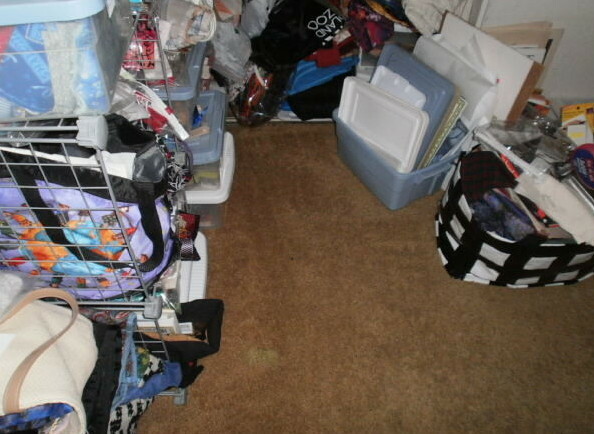 Second, I can see more of the floor. I don’t often get to see my floor, so I revel in the experience. I don’t even mind the extra vacuuming. The other experience worth reveling in this week was my beading project. 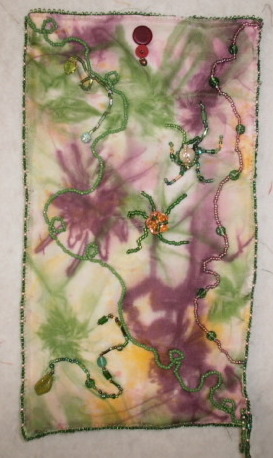 I started the pearl and bead strands on some hand-dyed silk. This week I finished enough of the beading that I can audition fabric to quilt and use behind the silk piece. Creative connections are a funny thing. I unearthed a package of blank artist cards earlier this month. They’re 2″ x 3″ coated cards that you can paint, sketch, collage or bling up anyway you choose. The result is a combination calling card-business logo-portfolio. 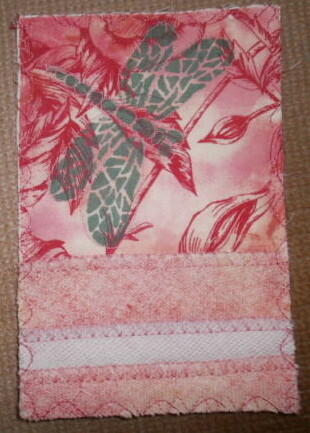 The little cards got me thinking about a quiltlet I had made for a friend with her logo on it. That thought led to the Challenge quiltlets I made for the place project. That thought led to the Christmas cards I give to my sci fi critque group, and that thought led to what they actually received this year. Since the holiday season means different things to different people, I planned to combine what this time of year means to me with an impression of what it might mean to someone else. The first thing that came to mind was my collection of Christmas fabrics, then my collection of Christmas and winter solstice embellishments, then my collection of embellishments in general. Since none of these collections shows any sign of magically disappearing, I pulled them out to see how much I could use for this project. By that time, any ideas I had about someone else’s concept of the season went flying off to parts unknown. Happy Holidays, everyone, whatever you celebrate!